see them overshadowed by achievements from the national team. Following the unprecedented successes of the national team and the game’s soaring popularity, Nepal was calling for a lift in domestic cricket that has always required professionalism, and EPL ushers that new beginning. 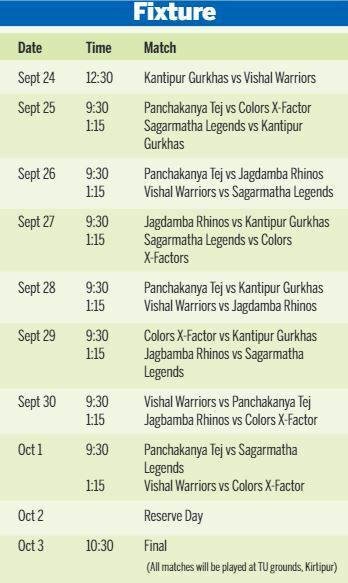 EPL incorporates something that the Nepali domestic cricket has not seen. Organisers Zohra Sports Management (ZSM) had come up with multiple formats of cricket—including Twenty20 and two-day cricket—of which it was only able to stage the 50-over tournament in 2014 in Dhangadhi before the event ran into controversy due to ownership issues. However, Aamir Akhtar, the ZSM Managing Director, remained resolute and a nod from the franchises have helped come up with an even better tournament that can be a launchpad of professionalism in Nepali cricket. As few of the top players from Associate world have already shown a keen interest in playing the EPL, its certain that the tournament is going to be a trend-setter among the non-Test playing countries. As Nepal’s progress in world cricket is still in a premature stage, EPL is certain to grab a widespread attention. EPL will witness 84 players from across the country playing for their franchises belonging to six big corporate houses. The players, classified into six categories, will get decent match fees never given before in the country. The captains of each franchise will get Rs 20,000 per match, while the lowest fee is Rs 8,000, paid to the regional cricketers. Additionally, a free entry with interactive activities during the match days offer a pure entertainment to the crowd who have long waited a domestic cricket tournament of this magnitude. What makes EPL so special? EPL has come at a time when Nepal has not been able to organise a national tournament for more than two years, thanks to the infighting between the under-performing officials of the cricket governing body which is now under the ICC suspension. The suspension of the Cricket Association of Nepal (CAN) was the worst thing, but inevitable too, that Nepali cricket has faced. Financially paralysed, Nepali cricket was thrown into a cauldron of lifelessness as cricketing activities have almost been nil. And then comes a lucrative EPL which assures money for the players, entertainment for the crowd and draws interest from the sponsors and owners. Under the gloomy circumstances that Nepali cricket has been in of late, EPL will bring in a new hope and relief. ZSM MD Akhtar believes he can put it in best possible way. “This (EPL) is the dream of Nepali cricket. It also becomes the need of the situation looking at the way how CAN has been suspended and ICC has clearly said that they are not looking after Nepal’s domestic structure under suspension. Its an ironical achievement that all the biggest industrialists of the country have come together with a clear intention of promoting domestic cricket in Nepal,” said Akhtar. “Also, this league gives the biggest cash incentives to 84 players and its coaches. There is not only one but plenty of good reasons why EPL has been so special. More than the established stars, the EPL can be a perfect stepping stone for the young talented cricketers,” Akhtar added. The regional national cricket tournament, a yearly calendar of CAN, incorporates almost 200 players and EPL needs to take a magnanimous shape adding more franchises. Akhtar doesn’t want his idea of EPL to get limited.